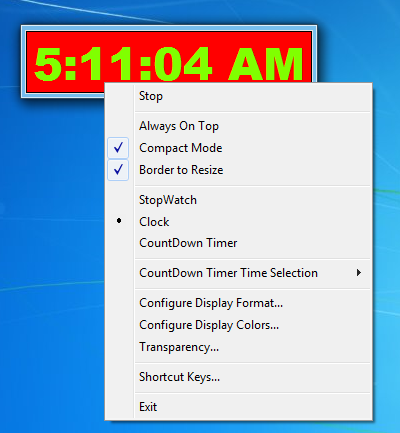 Wanna Run multiple and configurable clocks on your desktop ? Download the Countdown Timer and use it on your Windows 8 or Windows 7 computer easily and quickly. Initially the software displays a countdown timer which can be changed to colorful clock using the right click menu on the Countdown Timer’s interface. The Clock once displayed on your desktop can be marked to stay always on top as well and the colors can be changed easily as well. Whether you are using Windows 8, Windows 7 or any other version of windows, this colorful clock on your desktop can be really handy when you wish to track date / time of any other country or even your own country. The Clock can be resized or even made selectively transparent. The above figure displays a desktop clock running on Windows 8 and can be equally used on Windows 7 or other variants of Windows. Whether you are running 32 bit or 64 bit version of Windows 8, you can launch and use multiple clocks displaying time in your configured format. Download Desktop Clock for your Windows 8 computer and try it out for free.